I enjoyed knitting the Simple SKYP Socks for Laura so much I decided to make my own pair. These flew off the needles, probably because I used size 2 needles instead of my usual size 1 for socks. I always start my socks at the same part of the yarn colorway repeat, but I decided to live on the edge and not worry about that. This was a good pair to try that with, as I didn’t love the colorway to begin with. Even if their mismatched repeats bother me I would be more bothered by the 70s afghan portion. After knitting these socks I have confirmed that I much prefer matching socks. I still like these though, the yarn is smooshy and they have a nice halo. I need to branch out from making socks as they are getting kind of boring. 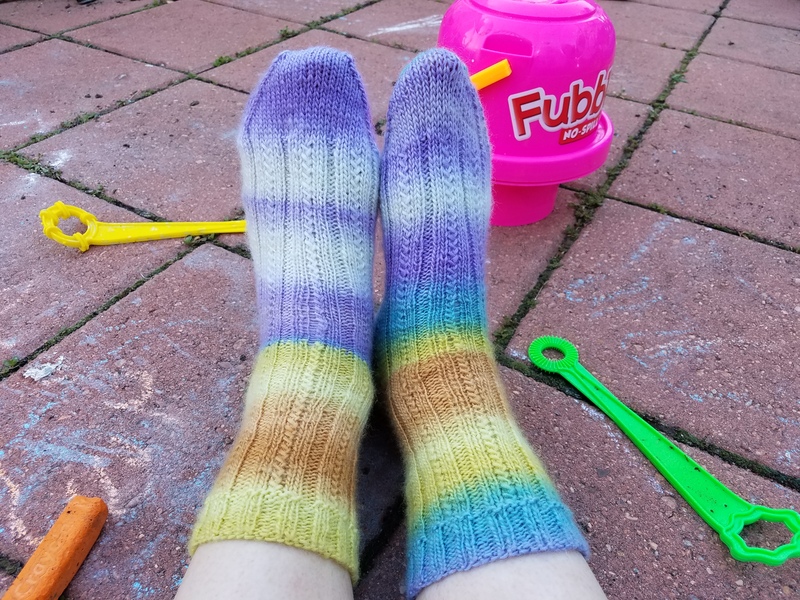 I keep making them because I have a large sock yarn stash and they are so easy to pick up when I have 5 minutes to knit.